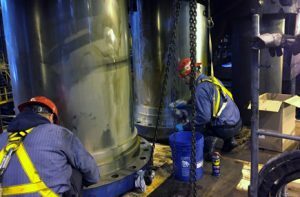 A&A provided the millwright and rigging services to disassemble and rebuild one of the largest open-die forging presses in North America. A&A was later relied on to install a new 4,000 ton forging press at this same location. Both projects required moving and installing extremely heavy components within tolerances of just a few thousands of an inch. Here at A&A, we do more than just move and rig your machinery. We provide you with the mechanical and millwright services to remove, relocate or install it. We can erect, assemble and disassemble your machinery & equipment, including leveling and alignment within the required levels of precision or tolerance. We can perform machine rebuilds and repairs per provided OEM or engineer specifications. We work with precision machined surfaces and components and know how to deal with press-fits, cold-shrinking, large and high-torque fasteners and precision tolerances. Traditional Instrumentation – high-precision spirit levels, precision tooling, sine bars, tram bars, indicators, and a large assortment of precision tooling, instruments, jigs and fixtures. Alignment Laser – PinPoint™ Laser Systems digital alignment system capable of providing measurements of .0001 inch or better over 80 feet or more.